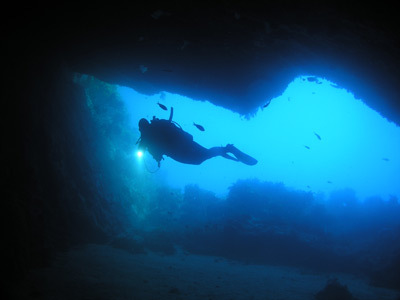 Michael McFadyen's Scuba Diving � Crystal Cave, Scary Cave and Oculina Point, Poor Knights, NZ The western most point of Aorangi Island, the southern most of the two main islands in the Poor Knights Islands is called Oculina Point. This is about one third of the way from the southern end of the island towards the north. This site has not one, but two caves. 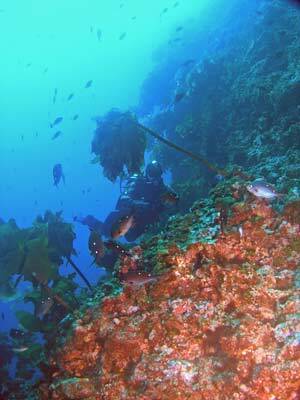 Doing the dive as I explain here will also dive Oculina Point which is considered a separate dive site. Just to the north of the point and east is a small bay. A GPS reading of S35� 29� 04.6� W174� 43� 59.1� (using WGS84 as a datum) will put you in the small bay. The main part of the site is, as you can imagine from the name, Crystal Cave. This is a very long cave and the last bit of it is called Scary Cave. The whole cave is also apparently known as Isabella Cave. The Scary Cave name comes from the fact that the last bit has a lot of freshwater in it and this apparently can make the visibility very poor and as it is 100% dark, you can get confused and lost. Hence, it is scary. Once anchored, drop off the back of the boat and descend. Head towards the corner and you should soon see the reef and the bottom. You should also soon see the entrance to the cave. 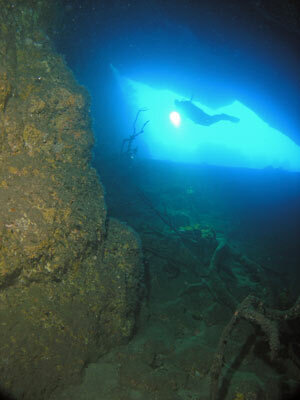 The depth outside the cave is about 13 metres and the floor is kelp covered rocks. As you approach the entrance it comes up to about 11 metres. The floor here is now sand, but in some spots there are small rocks. The sand here can be home to the incredibly ugly stargazers. Once inside the entrance, the cave drops from 10 metres and continues dropping as you go forward. The cave at first is wide and high but it then changes to a tall slot like cave and then again to a low and wide cave (all these descriptions are relative � it is not a huge cave cross-section wise). Once you move in about 20 metres it gets very dark and you will certainly need a torch to see your way ahead. After seven minutes or so you will reach a really low section and the depth will be 20 metres. When we did this dive, we turned around here as the cave was blocked by kelp and I could not be bothered pushing through it. This leads into the section of cave known as Scary Cave. This is said to be a quite open cavern but the vast amounts of freshwater that leak from above also bring silt that makes for a silty floor. It can easily be stirred up if not careful. 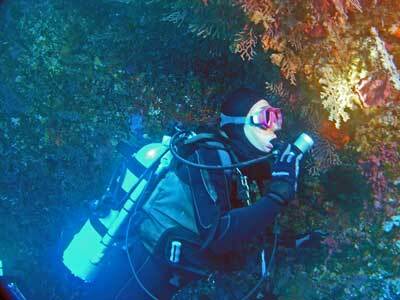 Kelly and I had planned to enter Scary Cave, but when we approached it, the cave was blocked by lots of kelp. At this section the cave is very low, meaning you probably have to almost slide in on your stomach. Our plan was that I would enter and leave Kelly at the entrance so that if it was extremely poor visibility, I would have her torch as a guide to lead me back to the exit. As I did not fancy pushing through the kelp and then not having eye to eye contact with her because of this, we decided to turn around. Apparently Scary Cave is quite large, but I am not sure exactly of how big. By the way, it must be at least 50 metres back to this spot from the entrance, perhaps longer. 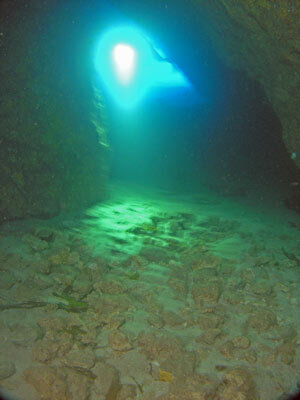 As you swim back, the cave gets lighter till eventually you can see the blue outside. 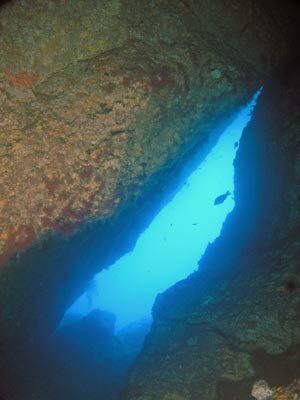 Once out of the cave, head straight ahead and north-west along the wall towards Oculina Point. 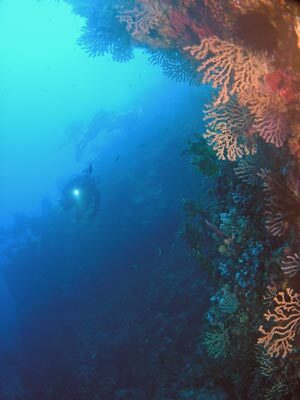 As mentioned, this is considered a separate dive site. The wall here is quite nice, with lots of small gorgonias. 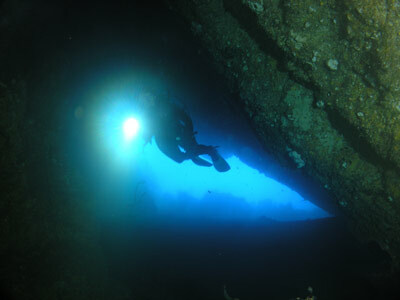 The depth drops to at least 30 metres. Once at the point, head south for a bit. The bottom here is at least 35 metres. You should see some medium to large bullrays in this area and there is always the possibility of seeing bronze whaler sharks. After you have gone 30 metres or so it is probably time to turn around and head back. A good idea is to come back shallower. Once you are back on the northern side of the point, make sure you come up to about 10 metres at least. If you at this depth you will see another cave. This is at about eight metres. It is really just a large hole in the reef wall, but is interesting anyway. From here continue along the wall to the east (south-east). Once back near the entrance to Crystal Cave you will start to turn north and then head north-east. A short distance past the cave you will see some ridges and bommies that run out to the north or north-west. These formations are quite interesting, with some cracks and the gaps between the ridges making a nice dive. The depth here is about 20 metres, although you could go deeper or stay shallower if you wanted to .On the day we dived here there were huge numbers of two-spot demoiselles and koheru. The koheru in particular were being harassed by a lot of kingfish. The kingies would come in and try to round the koheru up into a ball and one of them would then dash into the midst of the school. 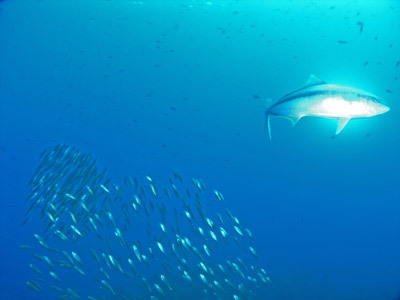 It was very exiting to watch this, with dozens of kingfish around at times. We ended up spending the last 20 minutes or so watching this as we gradually came up the wall and did our safety stop. Brilliant! 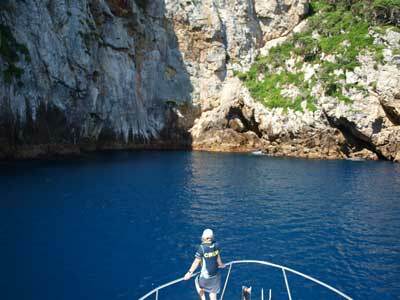 This is yet another excellent Poor Knights Islands dive site, with more caves and shear walls. 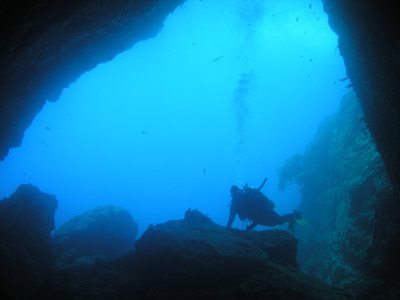 It requires a bit of care if you want to enter Scary Cave, but it should be able to be done by most experienced divers with care. 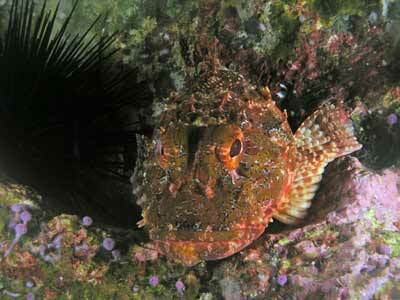 Visibility on our dive was 30 metres and the water temperature in March 20.8�C.